ProsReport is launching soon to college and university Alumni as an online business focused on sports that aggregates school related news while connecting alumni communities. This startup posts articles, features and interviews with alumni at their web site for alum, fans and student prospects to read and interact with. Sports Techie spoke with ProsReport.com founder and author, Caleb Wygal, about their companies exciting sportsbiz future. The first pioneering ProsReport customer was West Virginia University Pros at http://wvupros.com/. WVU was soon followed by Syracuse, N.C. State, the University of North Carolina and Florida State. Talks are underway with Florida, Auburn, Michigan State and Georgia Tech. WVUPros has a user base in the thousands while averaging 40,000 unique hits per month. I asked Caleb about his first ten WVU users and what that felt like after they joined in. Caleb shared a heartfelt story about how his, “very first article achieved 24 page views and the excitement that generated,” which is something I am sure a lot of fellow Sports Techie entrepreneurs who are just starting out can understand. Mountaineer Nation, be sure to frequent WVUPros.com for up to date football content about the upcoming New Era Pinstripe Bowl game versus Syracuse being played at Yankees Stadium in New York City and broadcast on ESPN. Content thus far has consisted of sports articles about football, basketball, soccer, volleyball and golf. The big picture plan is to provide news about alumni who excel in their chosen field, whether it is business, entertainment or arts, to each community. Their company goal is to become an online addition to current alumni magazines. Writers will be paid and offered industry exposure plus be given additional in-house training by their seasoned principles in exchange for web site content and Moderation. There is the possibility of a full time job for writers should things escalate quickly. There will be Live chats from time to time with athletes and other school icons. Look for a feature on each school page where alumni and fans of those schools can connect with each other by sharing their Twitter info. Log in will be through a Twitter or Facebook account. Their existing Daybook at WVUPros is being modified to be a downloadable calendar for mobile device use that will operate similar to Google functionality. Each school will have alumni events and things like who is playing on Sunday for the University World to know. Caleb created this business concept about three years ago. Adam came on board about six months later with a marketing background. Pat White is a known sports star in that he is the only quarterback in NCAA history to start and win four bowl games. Pat broke a variety of college and NCAA records and then got drafted into the NFL by the Miami Dolphins. Caleb and cofounder, Adam Gibson, introduced Pat to the business model and after several meetings his interest level peaked enough to arrange a formal partnership. “More than the notoriety, Pat White has a solid business mind,” said Caleb. Pat’s contributions have led to writing their finished mission statement and business plan. 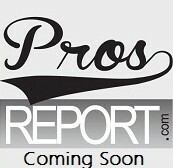 Look for Pat to promote and help get the world out about ProsReport. The other cofounder, Sri Kalapala, is based in Atlanta and has an entrepreneurial background. All four are Sports Techie. Sponsors are something they want to solicit right off the bat as a revenue stream. Another sport vertical that ProsReport is considering approaching is Leagues themselves such as the Big-12, Pac-12 or SEC. Existing business models by SB Nation and Bleacher Report have provided an organic growth formula they want to emulate within their own environment. Once the web site is launched next month their developer will concentrate on building an App for iOS and Android. Once the App is ready, they expect to see a spike in mobile device users. Merchandise is another revenue stream. ProsReport has a unique plan in that they will provide custom gear such as uniforms of different players with some of the proceeds going back directly to the player and their family. Look for marketing campaigns to begin next month in a drive to evangelize their business and services while serving to increase their customer and user base. Sports Techie, In sports, business and life, alumni can soon use ProsReport to provide school specific news and information about targeted alum, programs and departments such as Pat White, football or technology. I graduated a Whittier College Poet which is a liberal arts, Divison III school. We do not have many professional sports playing alumni over the years, although George Allen and Don Coryell both coached the football team which President Nixon was once a part of, however, lacrosse, chemistry or the political science departments might be a good fit. Ask yourself, could my school use ProsReport technology? Your answer is most likely, yes. The business model ProsReport is ready to execute makes sense. Many a Sports Techie want to be able to follow news about their schools favorite players or Professors and not have to search it out, which is what ProsReport does for you. They also unite alumni in an online community look and feel. The web site tie in with sponsors who want to reach these kinds of affluent communities is smart sportsbiz. If you see ProsReport open for business at your University or College, please let them know you heard about their company via Sports Techie and join right in, it’s informative, engaging and free.